compression outlet and requires no solvent welding. Description: 32mm x 3m polypropylene Pipe Manufactured to BS 5254. BS EN 1451-1:2000 Made in white polypropylene. this quick and easy to install waste system incorporating a compression outlet that accepts plastic and copper pipes. No solvent welding required Dimensions: 32mm x 3m.. Description: 32mm Straight Compression Coupling Manufactured to BS 5254. BS EN 1451-1:2000 Made in white polypropylene. this quick and easy to install waste system incorporating a compression outlet that accepts plastic and copper pipes. No solvent welding required Dimensions.. Description: 32mm 90 Degree Compression Bend Manufactured to BS 5254. 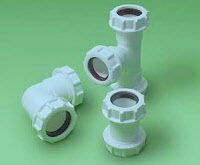 BS EN 1451-1:2000 Made in white polypropylene. this quick and easy to install waste system incorporating a compression outlet that accepts plastic and copper pipes. No solvent welding required Dimensions: .. Description: 32mm 135 Degree Compression Bend Manufactured to BS 5254. BS EN 1451-1:2000 Made in white polypropylene. this quick and easy to install waste system incorporating a compression outlet that accepts plastic and copper pipes. No solvent welding required Dimensions: .. Description: 32mm Compression Tee Manufactured to BS 5254. BS EN 1451-1:2000 Made in white polypropylene. this quick and easy to install waste system incorporating a compression outlet that accepts plastic and copper pipes. No solvent welding required Dimensions: 32mm .. Description: 32mm 90 Degree Conversion Bend Manufactured to BS 5254. BS EN 1451-1:2000 Made in white polypropylene. this quick and easy to install waste system incorporating a compression outlet that accepts plastic and copper pipes. No solvent welding required Dimensions: .. Description: Compression Reducer 40mm x 32mm Manufactured to BS 5254. BS EN 1451-1:2000 Made in white polypropylene. this quick and easy to install waste system incorporating a compression outlet that accepts plastic and copper pipes. No solvent welding required Dimensions: .. Specially formulated for the plumbing professional, Plumbers Gold is a new type of sealant and adhesive based on hybrid polymer technology that offers outstanding adhesion to all sanitary, bathroom, wetroom, kitchen and plumbing materials. For example, hard plastics, acrylics, fibreglass, ceramic..